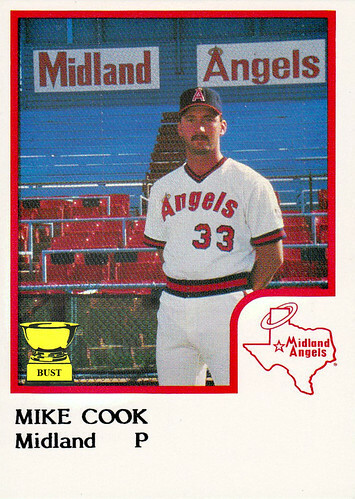 Angels' scouting report on Midland's Mike Cook: "Mustache is big league, but that's about it. ... Has Texas-size dreams, Rhode Island-size talent. ... Replace the second O in his last name with a C, and at least you have a few clubhouse laughs. ... There's a star in Texas in the team's logo; it's not this guy. ... Photo above actually taken during one of his starts. Fans knew he wasn't worth the price of admission. ... Cook? Yup. That would have been a better career choice."